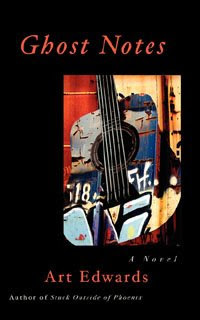 Today on the Layin' Down the Law Show, I sit down with musician, songwriter and now music-flavored novelist Danny White. (Hey, just like me!) Danny and I have so much in common, I thought my regular readers would like to get to know him and hear about what he's doing. So I flew Danny in from Nashville via Lear Jet to my palatial estate here in Oregon, just to give him a taste of the kind of treatment he can expect now that he's a novelist. LDL: Danny, thanks for taking the time to talk to me. White: Good to be here, Art. LDL: By the way, all of this grub--champagne, caviar, assorted cheeses, creme brulee--it's all for us. Please help yourself. That's my dog Georgia. If she gets too aggressive, just give her one of those olives. She loves those. So, tell us about the moment you got the idea for The Last Rock and Roll Show? White: I was in a camper van in Mitton, England with Tommy Allsup (who was Buddy Holly's guitar player) and the rest of the band this past June 2008. I was playing bass for Tommy (performing mostly Buddy Holly songs as well as his extensive catalog of work with Bob Wills and The Texas Playboys) and had also been with him on the 2007 tour in England as well. Bored and on the way to the next gig in London (I'm sure you know that feeling, Art), I just started writing for fun to pass the time. Before I knew it I had about 25 pages or so. I never intended to write a novel. LDL: Can you tell us why you chose Buddy Holly as part of the subject matter for your novel? White: The story is a combination of [elements of Buddy Holly's life story with] a search that I had done here in Nashville for a missing Elvis Presley recording. I had been hired to transfer over two hundred tapes that were personal recordings of Country Music Hall of Fame member Hank Snow. Snow was Elvis's manager at the time, and my chances of finding something, I thought, were good. I uncovered an unbelievable stash of never before heard recordings of some of Country music's greatest, but none from Elvis. The Elvis recording he did at the Grand Ole Opry in 1954 is still missing. The other element in the mix was two summers of learning about the Winter Dance Party Tour from Tommy. Tommy and Buddy were close friends. Once I replaced Elvis with Buddy Holly as the subject of the lost tapes, the novel pretty much crystallized itself in about ten minutes. It just took me 7 months to type it. LDL: I'm curious why you didn't choose to write a non-fiction book, some kind of biography of Buddy. What went into choosing the novel form? Did it free you up to create your own scenarios of the real life Buddy? White: Exactly! Spoken like a true novelist. I wanted to create a work of fiction that in the end readers would have to ask themselves whether or not it still could actually happen. That really got me going. The other side of the coin is that there are plenty of biographies on Buddy and only one other major novel about him. The other novel is Buddy Holly is Alive and Well on Ganymede. I thought it was time for another novel. 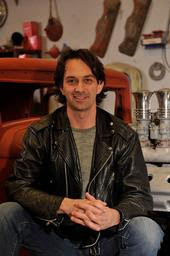 Plus, I could add into the story a passion of mine...Hot Rods. LDL: Georgia, get away from that cheese plate! I tell ya, that dog and her muenster. I'm sorry, Danny...What are some of your literary influences? White: I read a whole bunch of different things.--Steinbeck, Hemingway, etc. I really like the books by James Robbins and Steve Berry for something a little more current. Right now I'm reading a book called No Man Is An Island by Thomas Merton (a Trappist monk from the 1960s). It was humbling for me and I was even a little embarrassed to start writing this book as I had never attempted such a thing. However, I had to do it. I know you know that feeling too. I did the best I could in telling the story, and I am glad I did it. I learned a great deal in the journey. I think the writing is good, but the story is great. LDL: As a musician and a novelist, you're covering a great deal of creative ground. Do the processes have anything to do with each other? In what way does being a musician help you write fiction, or vice versa? White: Great question. I think if I'm writing songs for myself, the two fields have very little to do with each other. If I'm writing a song on Music Row to pitch to another artist, I can find more similarity there. Country songs are supposed to be great little three minute novels in my opinion. LDL: Now, you and I have met exactly once before this. At that time, you'd released a double album--as in vinyl--with this amazing packaging. I opened it up and immediately was transported back to my adolescent years, staring at the artwork of a Zeppelin album for the first time. The cover of The Last Rock and Roll Show is also gorgeous. How'd it come about? White: Well, that is very nice of you to say, Art. I'd like to take this opportunity to say that I think you are a fabulous bassist, and I enjoyed every minute of learning your parts for the Refreshments songs we did when I was in The Peacemakers. Those bass lines connected with people and moved them. I saw it night after night for over five years. Wow, the cover. A big subject. I wanted to tell the story with the artwork we created for the cover. If you "read" the cover, it tells a person quite a lot about what is inside without blowing it for them. The plane, the snow, the Route 66 sign in the middle that designates the change of location. Then, of course, the Hot Rod sitting on a dusty Southern California road and the kid with a tape in his hand. It was done by Rick von Dehl at Airshow Creative in Phoenix, who essentially read my mind in regard to what I had envisioned. The guy is a genius. LDL: Are there events planned to support The Last Rock and Roll Show? White: Yep, lots of 'em. Most of my focus right now is being centered on finding the right screen writers for a screenplay so I can pitch The Last Rock and Roll Show as a film. To support that end, I'm attending a load of Hot Rod shows. American Graffiti in Petaluma, CA in May is the next one. Then there are the music industry events (SXSW in Austin, TX in March). LDL: Aside from all this novel stuff, what's going on with Danny White the musician? White: I just started a band called King Hoochie with some guys over at Universal Publishing. Having a lot of fun with it and will record the debut album at the end of next month. It's sorta Led Zep-meets-The Faces and Stones kinda thing. Big fun. Just like high school! LDL: Where can people buy The Last Rock and Roll Show? The book should also be in the Iowa Rock and Roll Hall of Fame Gift shop in the next couple of weeks. LDL: One last question: Do you think Nick Scropos feels pressure to write a novel now? White: Of course. Since he owns a restaurant, I want to see a book about bass playing and burritos! By the way, Nick's a great guy. I think the world of him. I called him right after I left the band and told him to take the gig. LDL: Danny, thanks so much for swinging by Chez Art. It's a pleasure to see you again. Look out! Georgia just lapped up the rest of that deviled egg from your hors d'oeuvre plate. That dog. Here, let me wash that off for you. White: Thanks again, Art. I'll finish off the rest of what Georgia left for me while I was blabbering away. Slobbery muenster, mmm, mmm, good. LDL: There you have it, folks. Buddy Holly, King Hoochie, and slobbery muenster. Who says you don't get your money's worth here, eh? New Live Cut up on MySpace, plus New Gig!!! It's been a very musical week here in the Land Where the Law is Laid Down. 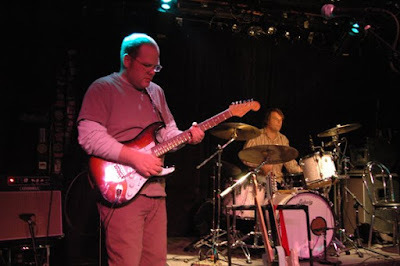 First of all, I've posted a live version of "Little Known Girl" from my show in Atlanta last year with the inimitable Bret Hartley on guitar and the ever tasty Kevin Leahy on Drums. This show, recorded off the board by Shalom at Eddie's Attic in Atlanta, is one that I've been listening to on and off for months now, and I thought I'd pass a nugget of it on to you. And not entirely inappropriate subject matter so close to Valentine's Day, eh? Come on over to my MySpace audio page and take a listen. You'll be glad you did. Next, a new gig! I will be laying down the law solo acoustic on Thursday, March 26, from 7:30 to 9:30 at a great little coffee shop called Twin Paradox in the Sellwood neighborhood of Portland. This place is newly redesigned, has great coffee and treats, is easy to find and has plenty of parking. This is my first show of 2009, and I will be pulling out all the stops to get you to come out early on a Thursday and listen to some classic and some brand new songs by your truly. Also, Twin Paradox doesn't ask but requires that performing artists play only original music or public domain songs. In other words, no covers. I thought this was so cool I contacted them instantly. So, mark March 26th on your calendar with a great, big, red "Art Lays Down the Law at Twin Paradox at 7:30." And did I mention this show is absolutely free? Just the right price during these troubled times, eh? 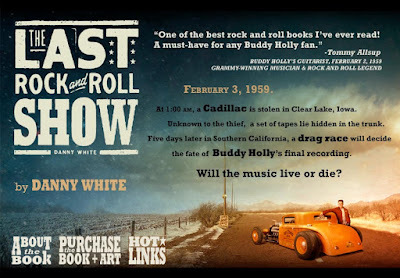 And next week, on this very blog, I will interview Nashville multi-talent Danny White, who just released his debut novel, The Last Rock and Roll Show. Danny and I will chat about his book, his music and what it's like to be a former-bass-player-of-a-band-fronted-by-Roger-Clyne-only-to-give-it-up-to-record-original-music-and-write-novels. (Danny and I have a lot in common, eh?) That's next week, right here at LDL. I leave you this week with a video that never, ever fails to bring a smile to my face. Get ready for some serious shredding. I think even I can play guitar better than that! First, let's all go to church, shall we? Feel free to enjoy the law being laid down as you read my list. These lists fly around all the social networks, and I got tagged this week. Once you've been tagged, you are supposed to write a note with 25 random things, facts, habits, or goals about you. At the end, choose 25 people to be tagged. Consider yourself tagged. 1. Already this morning I've sung songs by Billy Joel, Billy Ocean and Lenny Kravitz. 2. Almost all of my best memories revolve around pop music. An example? On the way to Death Valley, my wife bought a Marshall Tucker CD at a truck stop and proceeded to "prove" she knew every word to every song. 3. My paternal grandfather retired from John Deere. My maternal grandfather retired from J.I. Case (which is like John Deere). My father worked for a decade at John Deere. My mother retired from John Deere. Her three siblings all retired from or will retire from John Deere. 4. Hence, my workmanlike approach to novel writing. I've written two pages a day (rarely more, rarely less), five days a week, every week, every year, for over twelve years. I'm currently doubling this output to make sure I finish my third novel this year. 5. If I don't write, I get grouchy (and sometimes when I do). 6. As a child, I wanted to be a professional baseball player, until it dawned on my that being afraid of the ball would be a serious impediment to my career. At 14, I switched to wanting to be a rock 'n' roll bass player. At 28, I switched to wanting to be a novelist, which I've pursued ever since. 7. You've probably heard me yell "Yee Haw!" during the end credits of a certain television theme song. 8. I never want to be in a position where I have to tell someone how to dress. However, as a band leader, I have one requirement of the people who play with me: no cowboy hats. 9. I get very nervous around famous people. 10. My second novel is better than my first. My third is already better than my second. 11. I just recorded my first ever solo CD, after which I wrote the best song of my life. 12. I believe a musician's solution to every problem is, "Let's make another record." 13. I'm currently working on two creative projects--neither of which involve music or novel writing--that with some luck will be ready for debut within a year. 14. From the time I was 15, and not counting freelance work, I've had 23 jobs. The best one was my first, as a bus boy in Bettendorf, Iowa. I was good at it; I made minimum wage plus tips, which was more money than I knew what to do with; and all the girls liked me. 15. My second best job was delivering newspapers on the Pima Indian Reservation just outside of Phoenix, AZ. I had about 60 customers on the 55 mile route, had to brave dirt roads and stray dogs, and developed myriad and elaborate ways to launch newspapers out of my truck's open windows. 16. I've lived in Moline, IL; Phoenix, AZ; San Francisco, CA; Ashland, OR; Chicago, IL; but Portland, OR, where I now live, is my home. 17. 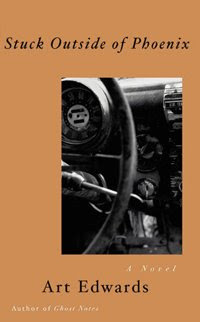 Not long ago, I wrote my first short story in years, *The Move*, which is about Hote--the protagonist of both of my published novels--when he was sixteen. I'm currently looking for a magazine to publish it. 18. No Hote in Novel 3. 19. I have an unnatural fear of sharks, which stems from having seen *Jaws* when I was seven. 20. I can name every member of most every heavy metal band from the first half of the 1980s. Example: Scorpions' bass player? Francis Buchholz. Iron Maiden's drummer? Nico McBrain. 21. I knew I wanted to be an artist when I first heard REM in 1987. I knew I wanted to write novels when I first read *Slaughterhouse Five* in 1988. 22. I will always find the easiest way to do any menial task. 23. I'm probably more of a math person than you'd expect. 24. I can only get excited about clothes when they're second-hand. 25. I believe the most important parts of any band are its songs and its drummer, followed closely by the way the singer's voice sounds.